Esthetic treatment of severely decayed primary teeth is one of the greatest challenges for pediatric dentists. 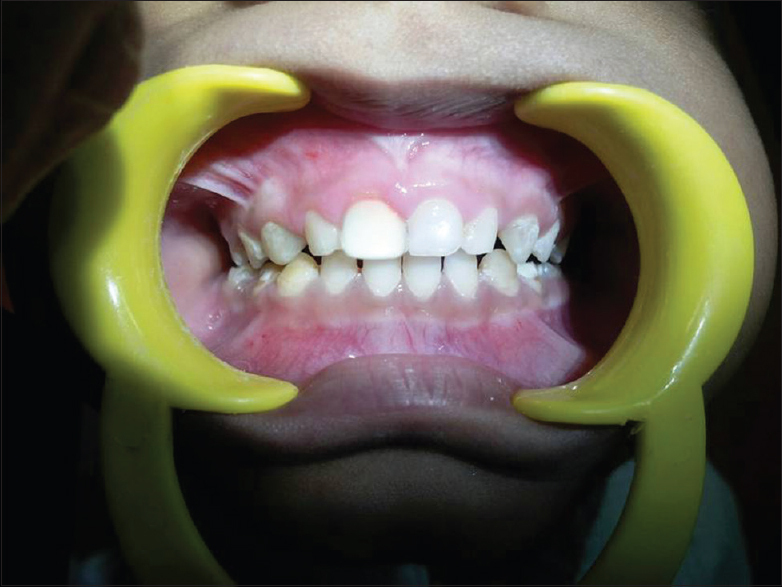 The use of esthetic restoration has become an important aspect of pediatric dentistry. Over the years, numerous techniques for restoring primary teeth have been attempted. Some techniques used for restoring complete crown coverage include polycarbonate crowns, acid etched crown, stainless steel crown (SSC), open–faced SSC with veneer placed on chair side, and commercially available preveneered SSC. The effective and efficient usage of these techniques is complicated due to technical, functional, or esthetic hurdles. Prefabricated zirconia crown (EZ-Pedo, Loomis, CA, USA; NuSmile ZR Primary Crowns, Houston, TX, USA; Hu-Friedy Mfg. Co., LLC, Chicago, IL, USA; Kinder Krowns, St. Louis Park, MN, USA; Cheng Crown, Exton, PA, USA; Zirkiz-Hass Corp. Korea) is an exceptionally strong ceramic crown and offers more esthetic and biocompatible full coverage for primary incisors and molars. They are anatomically contoured, metal free, completely bio-inert, and resistant to decay. Zirconia is well-known polymorph that occurs in three different forms: monoclinic (M), tetragonal (T), and cubic (C). Pure zirconia is monoclinic at room temperature and remains stable up to 1170°C. Above this temperature, it transforms into tetragonal and then into cubic phase at 2370°C. During cooling, the tetragonal phase transforms back to monoclinic in a temperature ranging from 100°C to 1070°C. The phase transformation taking place while cooling is associated with a volume expansion of approximately 3%–4%. Zirconia has a unique ability to resist crack propagation by being able to transform from one crystalline phase to another, and the resultant volume increase stops the crack and prevents it from propagating. Recently, the zirconium dioxide ceramic prefabricated crown has been used in the treatment of primary teeth. 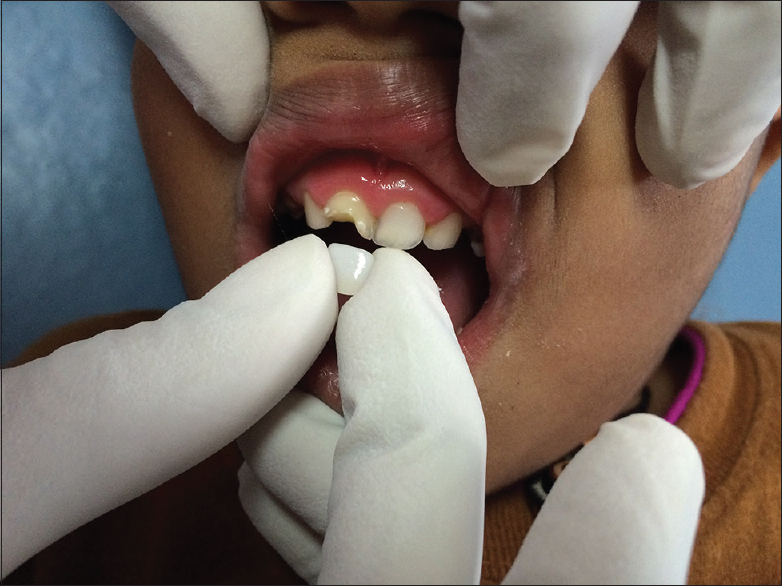 The purpose of this case report is to describe the clinical application and the rehabilitation of traumatized maxillary primary anterior teeth in a 4-year-old child using esthetic ready-made primary zirconia crowns. 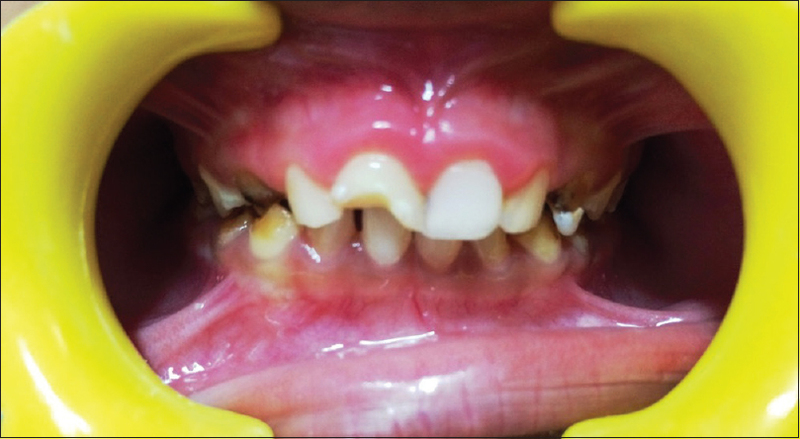 A 4-year-old boy was reported to the Department of Pedodontics and Preventive Dentistry with a chief complaint of pain in primary upper front teeth. His parents stated he had a history of fall 6 months back. On clinical examination, it was seen that 51 was discolored, with significant loss of tooth structure and dental caries in relation to 55, 63, 74, 73,75,83,84, and 85 [Figure 1]. Figure 1: Preoperative appearance of fractured 51. Following clinical and radiographic examination, the decision was made to give zirconia crown (EZ-Pedo, Loomis, CA, USA), in relation to 51 and composite restoration in 53, 63 and glass ionomer cement (GIC) restoration in 74, 75, 84, and 85. Diet analysis, counseling, and oral prophylaxis were carried out. Zirconia crown size was selected by placing the incisal edge of the zirconia crown against the incisal edge of the tooth [Figure 2]. Tooth was then prepared using a tapered diamond bur in a high-speed handpiece. The length of crown was first reduced incisally by 1.5–2 mm. Labial surface was reduced with a minimum of 0.5–1.0 of tooth structure in three planes (gingival-middle-incisal thirds). These three planes extend from 1 to 2 mm subgingivally all the way to the middle of the incisal edge of the preparation. The lingual surface was removed by removing. 75–1.25 mm of tooth structure from the lingual surface, extending from 1 to 2 mm subgingivally to the middle of the incisal edge of the prep following the natural contours of the existing clinical crown. Figure 2: Zirconia crown selection. Occlusion was checked to ensure there is adequate clearance from opposing dentition. Mesial and distal slices were made, tapered to a knife edge at gingival margin. The circumference of the overall preparation was ovoid when viewed from the incisal edge. After a trial fit of the crown, adjustments were done for labial and lingual borders, with a high-speed fine diamond bur under a lot of water because excess heat could cause microfractures in the crown. The final passive fit of the crown was confirmed and cemented with Type 1 GIC (Ketac 3M ESPE, St. Paul, MN, USA) [Figure 3]. The occlusion was checked and the patient was advised to come for regular checkups. Figure 3: Full coronal restoration using zirconia crown. Esthetic restorations on primary teeth have long been a challenge for the pediatric dentist. A variety of restorative options using full coverage are available for anterior primary teeth such as SSC, polycarbonate crowns, preveneered SSC, bonded resin strip crowns, and recently introduced zirconia crowns. The most obvious advantage of zirconia crowns is their excellent esthetics, which is far superior to other pediatric crown options. A much-simplified technique has been recommended using a bioceramic luting cement, ceramic crown, and bridge. This biomimetic material has high pH to resist acid and bacteria, is biocompatible and does not require an optimal condition for a good seal. Some drawbacks which limit the use of zirconia crowns are that it requires significantly more time to prepare the tooth for fitting the crown. Bleeding from the gum, due to anxiety or inflammation, may hinder the setting of the cement used to bond the zirconia crown to the tooth. With crying or inability to sit still and fully cooperate for the procedure, an SSC would be preferable; since the preparation of the tooth and fitting an SSC takes much less time, but with the latest innovations manufacturers are trying to minimize these factors. Ez-Pedo has introduced Zir-Lock ultra, mechanical undercuts to increase crown retention. Another point to consider is that zirconia crowns not contaminated with blood or saliva have better adhesion to cement and to solve this problem NuSmile came up with the try-in pink crown. A literature search (PubMed/MEDLINE/Medknow/Google Scholar) using terms “primary anterior zirconia,” “deciduous teeth zirconia,” “deciduous anterior teeth zirconia,” and “primary anterior and posterior teeth zirconia” retrieved only two paper related to zirconia pediatric crowns. In vitro study was done by Townsend et al., to measure the fracture resistance of three commercially available zirconia crowns for primary molar and compare it with the thickness of the zirconia crowns and the measured fracture resistance of preveneered SSCs. It was found that the increase in force is correlated with crown thickness. The forces required to fracture the preveneered SSCs were greater than the forces required to fracture all manufacturers' zirconia crowns. In other randomized clinical trial by Walia et al., compared the restoration failure, tooth wear of opposing teeth and gingival health of three esthetic full-coronal restorations (composite strip crowns, preveneered SSCs, and prefabricated primary zirconia crowns) in carious and traumatized primary maxillary incisors. The retention rate was highest for zirconia crowns (100%) followed by preveneered SSCs (95%). Strip crowns were the least retentive (78%) because of highly sensitive technique zirconia crowns showed low-grade abrasion in four opposing teeth. Teeth restored with resin composite, and preveneered SSC showed an increase in mean gingival index score, while corresponding values decreased in zirconia crowns at 6-month follow-up. Although clinical long-term evaluations are a critical requirement to conclude that zirconia pediatric crowns have good reliability. It is expected that in the near future, prefabricated zirconia crowns could be an easy, restorative option to traditional stainless steel and composite strip crowns due to their unparalleled advantages. Zirconia crowns offer high-end esthetics, superior durability, and easy placement compared to composite restorations and strip crowns. Waggoner WF, Cohen H. Failure strength of four veneered primary stainless steel crowns. Pediatr Dent 1995;17:36-40. Larsson C. Zirconium dioxide based dental restorations. Studies on clinical performance and fracture behaviour. Swed Dent J Suppl 2011;213:9 84. Wolfart M, Lehmann F, Wolfart S, Kern M. Durability of the resin bond strength to zirconia ceramic after using different surface conditioning methods. Dent Mater 2007;23:45-0. Derand T, Molin M, Kvam K. Bond strength of composite luting cement to zirconia ceramic surfaces. Dent Mater 2005;21:1158-62. Schwartz S. Full Coverage Aesthetic Restoration of Anterior Primary Teeth. Available from: http://www.dentalcare.com/en US/ dental education/continuing education/ce379/ce379.aspx. [Last accessed on 2015 Mar 26]. Karaca S, Ozbay G, Kargul B. Primary zirconia crown restorations for children with early childhood caries. Acta Stomatol Croat 2013;47:64-71. Soxman JA. The Handbook of Clinical Techniques in Pediatric Dentistry. Hoboken: Wiley-Blackwell; 2015. p. 47-50. Planells del Pozo P, Fuks AB. Zirconia crowns – An esthetic and resistant restorative alternative for ECC affected primary teeth. J Clin Pediatr Dent 2014;38:193-5. Stawarczyk B, Basler T, Ender A, Roos M, Ozcan M, Hämmerle C. Effect of surface conditioning with airborne-particle abrasion on the tensile strength of polymeric CAD/CAM crowns luted with self-adhesive and conventional resin cements. J Prosthet Dent 2012;107:94-101. Kraft L, Saksi M, Hermansson L, Pameijer CH. A five-year retrospective clinical study of a calcium-aluminate in retrograde endodontics. J Dent Res 2009;88:1333. Townsend JA, Knoell P, Yu Q, Zhang JF, Wang Y, Zhu H, et al. In vitro fracture resistance of three commercially available zirconia crowns for primary molars. Pediatr Dent 2014;36:125-9.